The perfect way to remove scratches and restore the brushed/satin finish on smaller areas of your watch. This pen is ideal for working around pushers and crowns, getting into tight areas, and restoring bezels to showcase condition. This pad remove scratches and scuffs and produce a perfect OEM factory brushed / satin finish. 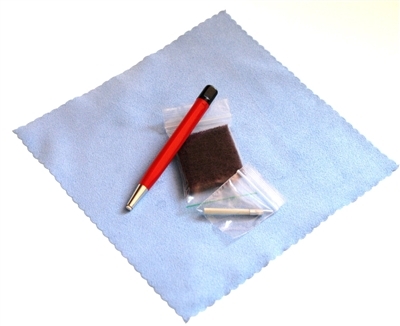 The pad is exceptional for restoring bracelets, clasps, and cases to new condition. Each of these products includes a complete set of instructions for their proper use. The instructions are easy to understand and will allow you to produce professional results the first time you use the product. Of course, you can always email us if you have a question or need more specific help. Many of our clients who have never done any refinishing before tell us that on their first try they achieved results significantly better then those achieved when they were paying for 'professional' polishing and restoration.... waiting weeks or even months to get their watch back. The peace of mind you'll have in knowing that you can wear your watch without worrying about an accidental scuff or scrape makes the experience of owning a great watch even more satisfying. It's great to know that no matter what happens, you'll be able to bring your watch back to perfect in a matter of a few minutes. We don't recommend the use of these products (except the Ultimate Microfiber Watch Polishing Cloth) on white gold watches. White gold watches are usually plated with rhodium to produce the final lustre. The excessive use of polishing and refinishing products can remove the rhodium plating and produce slight color changes in the metal. These products are all safe for yellow gold, rose or pink gold, stainless steel, platinum, and titanium watches. All of the tools and products that we offer have been extensively tested in our shop for quality, durability, and utility.